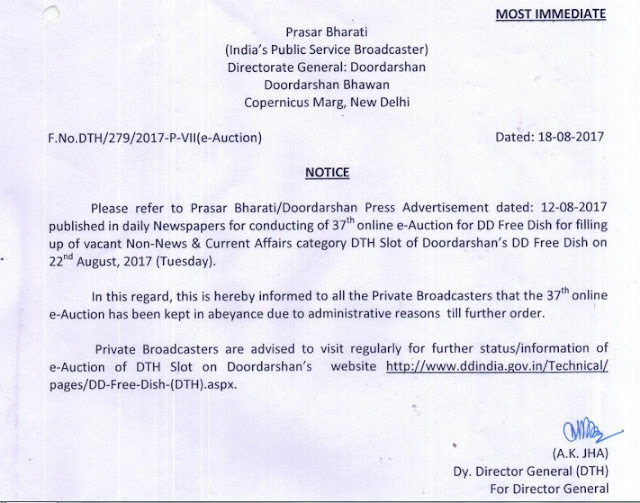 Doordarshan Prasar Bharti notify a notice on official website "DD India" that 37th online e-Auction has been kept in abeyance due to administrative reasons till further order. "This is hereby informed to all the private broadcasters that the 37th online e-Auction has been kept in abeyance due to administrative reasons till further order. Private Broadcasters are advised to visit regularly for further status/information of e-Auction of DTH Slot on Doordarshan‘s website "www.ddindia.gov.in/Technical/pages/DD-Free-Dish-(DTH).asps." Here you can view original notice posted on Doordarshan website.